With things heating up in the state in terms of the weather, and a surge in the alteration of the climate pattern, a reasonable question comes to mind – how do we combat this problem? We were warned of the effects of environmental degradation and the outcome is already upon us. Urban spaces are infinitely more affected due to the depletion of forest cover and concrete’s unique heat absorbing and dissipating attribute. One of the solutions offered to restore the semblance of temperature balance is creating more green spaces in our cities. The suggestion seems simple enough in theory, but how viable is it in reality? This is one of the queries put forward by Green Essentials’ Karan Manral and Yogita Mehra. The couple, who offer their services to clients in growing organic kitchen gardens, have a proposal to create urban forests in Panjim city through a collaborative effort. This includes the Municipality, the State Government, the Forest Department and citizens. There are gardens in Panjim, such as Garcia de Orta and the forest park at Campal, which are noteworthy but inadequate in their design to provide relief from the high temperatures that prevail in the city. Garcia de Orta in particular does not have enough trees for shade; since the grass is off limits, children cannot play here; and it has definitely not been planned to cool the area down. If a city is developed keeping in mind ecological consequences and built around wooded areas, specific green spaces would not be necessary. Since this is not the case, and with an understanding that gardens by themselves are not the solution to the problem, what we require is something that resembles a tropical forest but is not quite one. Most people would be hesitant to give up an asset in the form of land to create an urban forest. ‘We are at that cusp in Panjim, where if you don’t start now, ten years later you will find that none of this land is there. And then you will spend ten times the amount of effort, and maybe never achieve the forest simply because it is too late,’ says Karan. Giving an example of a forest grown in Coimbatore by a friend, Karan sought to explain how an urban forest is possible despite difficult circumstances. This particular forest that is two and a half years old and has been grown on saline land that lay unused for agricultural purposes, has trees measuring twenty five feet and more with less than 1000 mm of annual rainfall. It is a dense forest with about 68 varieties of trees that were grown by two people who were novices in growing vegetation. They had labourers to help them at the outset but now labourers come in for maintenance only about once a year. 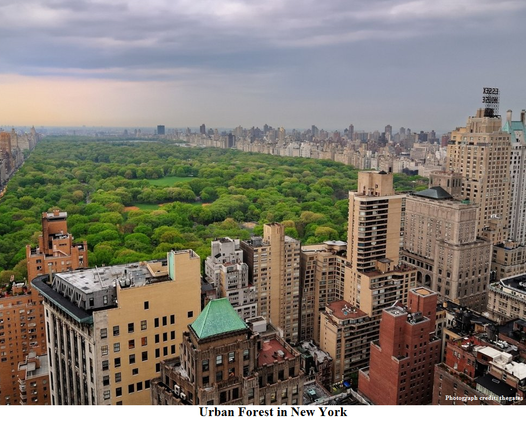 Most great cities in the world, such as Seattle and New York, have urban forests within them and not all are there by chance. This is well strategised planning to ensure a diminished environmental impact and maintain the health of the city’s occupants. So how do we convince people in Panjim that we need an urban forest growing here? People need to understand the benefits of a forest in order to rope them into the plan wholeheartedly. For one, the root system and cover of the trees holds rain water in larger amounts which can become available when the rain stops. Trees provide a carbon sink and hence reduce air pollution. They lead to encouraging greater biodiversity and reduce pollution and heat related illnesses. People, especially children, would be better connected to nature and consequently with each other. Lower temperatures will enable energy saving, and the tree will add value to real estate. The urban forest proposed will function as a leisure spot for the elderly and the very young. There are so many benefits that it seems foolish not to root for urban forests. The good news is that Panjim has only 5% shortfall of the required tree cover as per the guidelines of the Ministry of Urban Development (18%-20% for a city the size of Panjim). Yet the potential that 5% offers is amazing in the effect it could have in reversing the detrimental consequences of pollution and unmitigated land development in the city. Gauging the attitude of the establishment and city planners towards urban forests gives one the impression of apathy. Therefore launching such a project is a matter of obtaining the right opportunity. This has come in the form of plans to turn Panjim into a ‘smart city’, and adding an urban forest is on the cards. So, while the Central Government wants a hundred smart cities, it actually wants urban forests in two hundred cities in the country. Then, separately, the Forest Department approached Karan and Yogita for the purpose of creating an urban forest because of the 2015 Nagar Van Udyan Yojana, with an offer of the 41 hectares of land along the Miramar stretch between the road and the beach. An unlikely area to envision an urban forest, but Karan says it is already semi-forested. ‘Imagine! The Central Government is on the same page, the city is on the same page, the GSIDC (Goa State Infrastructure Development Corporation) and the Forest Department is on the same page. Everyone actually wants a forest whatever their reasons and motivations may be,’ says Karan, embracing the opportunity it presents. The citizens’ attitude and participation in the project is vital to the continued effort to create and preserve this urban forest. It is necessary to reach out to those people who are indifferent to the situation and get them on board, as well as plan for many years to come about the progression of this project. ‘I found at least two hundred kinds of trees, shrubs, creepers, bushes, herbs, different kinds of lawn that grow by the seaside…These are just two hundred species that can survive this type of an environment,’ says Yogita, as she explains that the predominant casuarina trees that have been planted in the Miramar region need to be, and can be, replaced with other plants and trees, adding to the biodiversity and generating a multi-layered forest. Other plans for the area to be forested, which would also increase the value of the urban forest to the general public, include creating separate walking, running and cycling tracks so people who engage in these activities have a pleasant space and do not get in the way of others. A botanical garden, an extensive nursery to supply a range of plant and tree saplings, longer forest trails, and facilities for those who avail of the benefits of the forest to sustain the quality of the surroundings are also suggested. A team of likeminded people who can invest themselves in the future of the forest is needed. As insufficient funding is a looming problem, the corporate sector will have to be approached for funding. The advantage of having the Forest Department as a partner is that it is able to work at low costs. However, rules and guidelines need to be set to prevent the inordinate planting of trees that are in no way beneficial to the ecology of the state, and other issues. Karan and Yogita are inviting people to share ideas with them and join the initiative to have an urban forest in Panjim. It is time to do something concrete about the concerns we have about the degradation of the environment and our floundering climate conditions.